Well ORA has done it again, and after much rumored speculation, the nearly all white "Platinum Perculas" have been released on a very limited basis. These fish will make any collector drool. "This month we are introducing one of the most eagerly anticipated new strains of clownfish ever developed at ORA™. 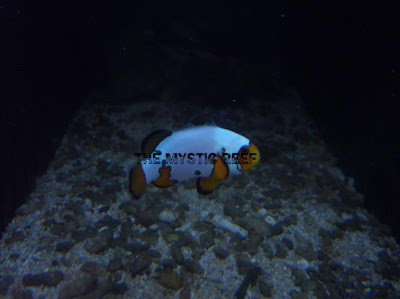 The Platinum Percula is a nearly all white variation of the True Percula Clownfish. 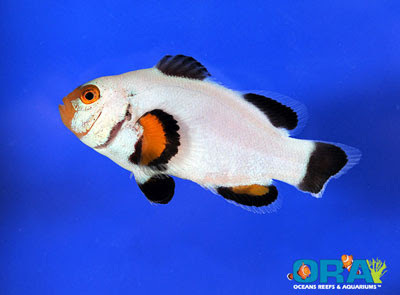 The result of years of selective breeding, the Platinum Percula is derived from our famous Picasso Clownfish. This striking white clownfish develops orange and then black fins as it matures, and retains some orange color in the face. Not to be confused with the Snowflake Clownfish, which is actually A. ocellaris, the Platinum Percula shows none of the original stripes characteristic of the species. While the middle stripe of the Snowflake is wide and has jagged edges, the Platinum Percula is continuously white from head to tail. No other clownfish, from the wild or from breeders, has ever come close to appearance of the Platinum Percula. This is the rarest of any clownfish color morph ever developed, and it will be the ultimate prize for any serious clownfish connoisseur. While experimenting with pairing new Picassos, even the breeders at ORA™ were surprised to find this extraordinary result. As the juveniles began to grow-out we noticed the development of black fins on the rapid growers. At first the dorsal, pectoral, ventral and caudal fins appeared to be clear with some orange color. Then some black pigment appeared on the fins, as true perculas typically do produce more black color as they age. Finally we observed the full black fin color develop, and nothing looked more astonishing than black fins on a white clownfish. These fish will be shipped as juveniles with very little fin color, but expect to observe the full color develop over time." "We are very excited to release the Blue Chalice coral, Echinopora lamellosa. This coral has a beautiful plating, wavy growth form that is similar to Montipora capricornis. Under natural sunlight this coral is a pinkish tan color but under higher Kelvin metal halide or T5 lights it will turn a beautiful lavender to baby blue color. 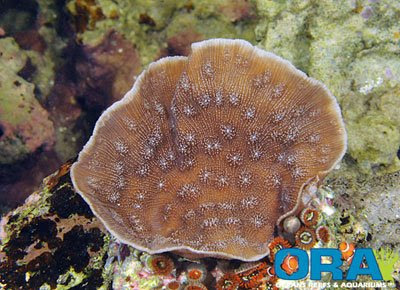 Our broodstock for this coral came from two sources back in 2002. Some was from a German hobbyist who stated the coral was originally collected in 1989, the rest was from a hobbyist named Randy Donowitz"
If you are interested in any of these new products, be sure to contact us ASAP, as they are sure to go fast. Availability will be on a first come, first serve basis. You can Call us at (951)727-8332 or email us at: themysticreef@hotmail.com or sales@themysticreef.com. In a world where living green is on everyone's mind, how does it affect the reefkeeping hobby? When all of the planet's resources are in demand, how do we ensure the future of our hobby, when even the future of wild reefs is unknown? It is a true fact that reefs all over the world are in decline, and it is very simple to point fingers at the aquarium industry, when in fact the true causes go far deeper that. Much of the destruction is caused by overfishing for the food industry, or by irresponsible divers, as well as pollution and of course rising ocean temperatures and elevated CO2 levels. Any aquarist using a calcium reactor knows that excess CO2 causes a drop in pH, creating a more acidic solution, to the point where it will dissolve reactor media (coral skeletons). However, there are places in the world where conservation has come to the attention of the local communities, and those areas are showing great signs of resiliency. Fish collected for the marine aquarium hobby earn local collectors on average 5 times as much as fish caught for food, making them far more profitable for local villagers in often third world countries. Times have certainly changed in the past few years, to the point where owning a thriving reef aquarium is no longer the realm of public aquariums and a handful of private aquarists, but accessable to all ages and walks of life. We all need to take heed from the freshwater side of the hobby, where in some places upwards of 90% of the fish are tank raised, we just need pioneering aquarist to unlock the secrets of their saltwater cousins, as well as the urging of hobbyiests for more tank raised fish. Only through the s upport of the hobbyists will this ever become a reality. 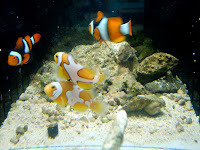 There are a number of farms raising various species of Clowns, Gobies, Pseudochromis, Cardinal fish and more, but if no one is willing to pay a few extra dollars for a fish that is a thousand fold more suited to tank life. The Bangaii cardinal is a perfect example, this fish has a VERY limited range in nature, and collection has pushed it the point that it in danger of becoming extinct (http://teacher.scholastic.com/scholasticnews/indepth/endangered_species/news/index.asp?article=reeffishguide). Several farms, such as O.R.A., have been successful in raising these fish for the trade, and farm raised should be the only option for this fish, especially considering the high mortality rate of these fish in transit. Tank raised corals and fish are much better suited to aquarium life than their wild cousins for countless reasons. The fish are already used to living in a glass box, and are usually eating readily available foods such as pellet or frozen. One of the biggest reasons is that they do not have to endure being in a small bag for 36-48 hours or more as well as the rest of the rigors of transit across oceans, which applies to both corals and fish. Tank grown coral frags have a much better ability to adapt to various tank conditions opposed to a mature wild colony, as anyone whos ever purchased a beautifully colored colony only to have it turn brown or even die within a few days. Corals grow to adapt to the lighting and water flow conditions, which is very different on a natural reef exposed to intense sunlight and massive surge flows from wave action and currents than a tank with a few powerheads and some metal halide lights. A fragment will be able to grow those specific conditions present in a tank, to the point where tank grown corals are often indistinguishable from their wild counterparts. Well, I feel like I've barely scratched the surface of this very broad topic, but there will be more soon to come. As my first post, I feel this is more of an overview while trying to cover various points. I will go into more detail on each point in subsequent posts. 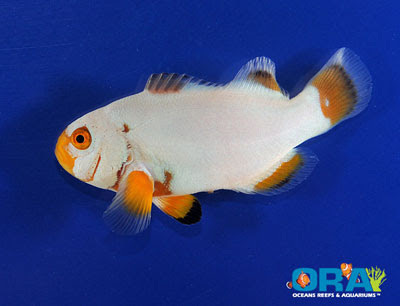 All photos are of tank raised livestock, including the Snowflake and Picasso Clownfish from ORA farms.